WCPR wants to provide you with an outlet for life-long learning. It is never too late to teach yourself something new….let us guide you through that process. These classes are programs that fall outside of either the Health & Wellness or Arts & Crafts categories. Program options vary throughout the year and from facility to facility. We also offer a variety of other programs which may be found in other areas of the website. Please see Health & Wellness, Music Classes and Art Classes for more programs. Questions? Contact Shelley Egly at 615-790-5719 ext. 2020 or at Shelley.Egly@williamsoncounty-tn.gov. In this class, students will learn the martial art of Tae Kwon-Do. Students that learn the art of Tae Kwon-Do also gain the benefit of learning the techniques and ways of self defense, which can generate higher self-esteem and confidence. 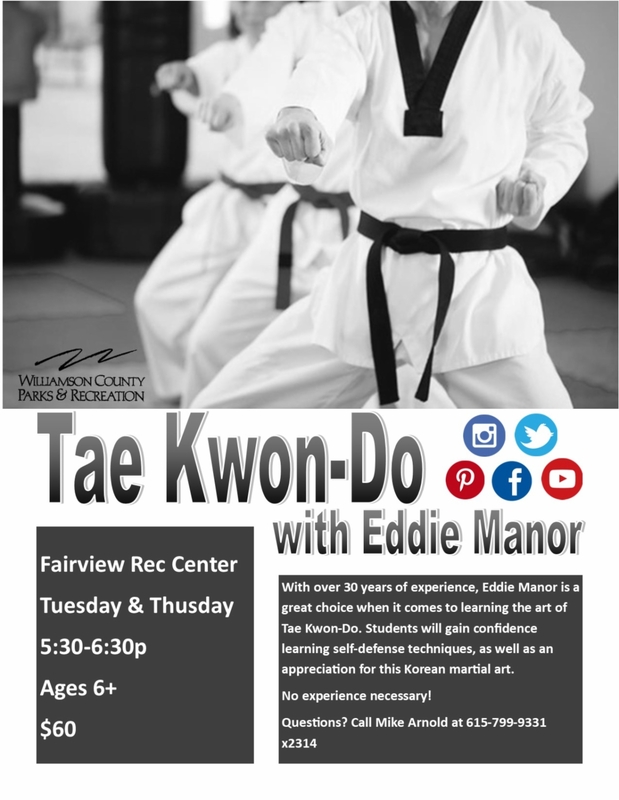 Eddie Manor is a 3rd Degree Black Belt and has over 37 years of experience with the art of Tae Kwon-Do. Tap into your body's energy, reduce your daily stress and feel more energized! Tai Chi utilizes smooth, continuous, low-impact movements to help you unwind while improving your balance, posture and strength. No experience necessary. A combination of Judo and Karate will gives students a well-rounded program of physical fitness, and self-confidence through increased self-esteem and self-defense skills. Students can progress through black belt and will have the opportunity to compete in tournaments. For information, contact (615)302-0971 ext. 2210. Instructor: Richard Javitt. For information regarding registration, payment, or refund, please contact Chase Cribbs, Chase.Cribbs@williamsoncounty-tn.gov or 615-302-0971 x 2214. Learn to dance like the island natives of Hawaii, Samoa, New Zealand, and Tahiti. Instructor, Chris Hendrickson uses these dance representations as a form of both exercise and education.